Finished the Twisted Fiber Arts 'Scorched' (70% merino/30% mohair blend) and it is just as hot and colorful as its name implies. 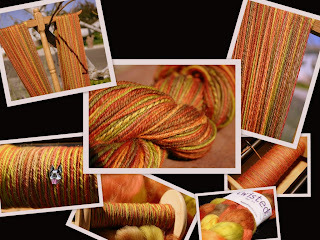 I love the finished yarn but didn't really enjoy spinning it - just don't care for merino. Glad to have it out of the fiber stash - and into the yarn stash. And also glad to be moving on.